GOVERNOR’S CUP: Three Star lost in penalty shootout. After Bombay Bengal Club made complaint about a player not registered in Three Star, Organiser Sikkim Football Association replayed the quarterfinal match between Three Star and Bombay Bengal which was earlier won by Three Star. In replayed match Indian side won by 5-4 in penalty shootout when it was 1-1 in full time. Deepka Bhusal’s goal on 19 minute was enough for Nepal’s Manag Marsyangdi Club (MCC) to defeat strong Indian club Mohammed Sporting Club in quarterfinal of Governors Cup here in Sikkim. This shows Nepali clubs despite poor facility and not enough financial support can dominate any big clubs of sub-continent. Earlier Three Star Club stunned Indian big giant Pune FC. Two strong clubs of Nepal Three Star and Manag Marsyangdi Club are working hard to make Nepalese fans happy in Governor’s cup in Sikkim India. Three Star is taking on unknown Bombay Bengal FC whereas MMC will lock horn with Kolkotta League giant and I-League 2nd division club Mohammed Sporting Club in Quarter Finals of the tournament. Earlier Three Star defeated I-league club Pune FC to enter Semis and MMC defeated local Sikkimeli club founded by Indian star Bhaichung Bhutia. Jawalakhel Youth Club enters semi final of Tillotama Gold Cup in Butwal after defeating national league champion Nepal Police Club by 2-1. Cops manager and former international Hari Khadka blamed poor judgment of referee for defeat. Now JYC meets new surprised pack Himalayan Sherpa Club in semis who came out as winner in their first knock out tourney held in Kathmandu. Dear sports lovers. After a short break now we are back again with big bang. Stay tuned for the latest news, views and gossips of Nepalese football and cricket. In the meantime, let’s wish for Nepalese clubs Three Star and Manang Marsyangdi for success in prestigious tournament All India Governor’s cup in Sikkim. And wishing all the best for all the teams participating in Tillottoma Gold Cup in Butwal. Similarly, in cricket front many many congratulations to Nepalese girls for winning ACC U-19 trophy in Hong Kong. 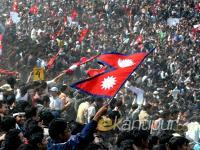 In men’s level Nepal is almost certain to host ACC T20 trophy in 2011, wishing them all the best for preparation. More updates coming to your screen soon.